It's easy to get lost in the sea of Twitter client apps available on the Google Play Store, and that makes finding the right fit a time-consuming process. But you're in luck — we've done the legwork for you by comparing the top Twitter clients in granular detail, looking at all of the features to find out which one's the best. After countless hours of research, we're confident that the apps below are the cream of the crop when it comes to free third-party Twitter clients for Android. Play Store Rating: The app's overall rating among users. Supported Accounts: The number of simultaneous Twitter logins you can use. Mixing work and pleasure can land you in trouble, so having a client that lets you stay on top of multiple accounts saves you from the headache of manually switching between them. Pro Features: Purchasing the full or pro version of an app will usually unlock more features, along with removal of advertisements. Ad Type: Since these are free apps, ads are a necessary evil that we have to live with. Some apps are better at dealing with it, however, and display ads in ingenious ways to make them almost unnoticeable. Widgets: This handy option lets you see new tweets right on your device's home screen. Interactive Notifications: When supported, this small but useful feature enables you to preview new tweets and other alerts to decide whether to open the app to view in full or simply dismiss. App Shortcuts: Similar to the iPhone's 3D Touch, this feature lets you shoot tweets or send messages on the fly simply by performing a long press on the app's icon and tapping on one of the available options from the popup that appears. In-App YouTube Playback: Watching YouTube videos from within the app itself is ideal, as it saves you from the hassle of having to switch between apps and lets you continue looking through your timeline without skipping a beat. Instagram Image Support: Basically the same as watching YouTube videos above, but in this case, while viewing content such as images and GIFs that originate from Instagram. Dark Mode: Dark theme support has become a desirable feature for many, and is not only easier on your eyes, but can also save battery life. Customizable UI: Having the ability to personalize an app's user interface has become standard for many apps, and can range from applying different colors to changing font size. Swipe to Navigate: Navigating between numerous tabs can be tedious when performed with taps alone, so having the ability to swipe sideways from one page to another has a big impact in enhancing user experience. Schedule Posts: This feature is especially handy for habitual posters, as it enables them to automatically tweet out ideas and thoughts in regular intervals to keep their content flowing. Post Muting: Your Twitter feed is constantly bombarded with distracting posts that often bury important tweets. Muting these annoying posts clears out your feed and ensures you only view what you need to. Download Content: Having this functionality is extremely useful, as it lets you save media into your device to enjoy anytime you want, without having to revisit the original tweet. Post GIFs Oftentimes, a GIF can convey your thoughts and leave a stronger impression than words alone. Location Tagging: This feature lets you share your location and is helpful for arranging meetups. Save Drafts: A brilliant idea often comes out of nowhere, though it sometimes takes a little more time to string the right words together to properly convey the message. This is where drafts come in handy. Search Location: Where the search function is located inside of the app. As a vital feature, we preferred apps that let you search in one tap from the navigation bar over apps that force you to tap a menu button, then find the search option. Send Direct Messages: The ability to send private messages to other Twitter users that are not visible to the public. To narrow down the field of Twitter apps, we set up some ground rules. First, all apps had to have a free version, so that ruled out great options like Talon and Tweetings. Then, to ensure we're dealing with the best of the best, all apps had to have a Play Store rating of 4.3 stars or higher to make this list. This ruled out several popular Twitter apps such as Falcon, Plume and Finch. From there, we whittled our original list down to five apps based on how the apps scored in the comparison points above. That left us with the five best Twitter client apps, which I'll highlight in detail below. Owly for Twitter takes the top spot thanks to useful features that seamlessly blend together to enhance your Twitter experience, relatively free of charge. Owly gives you the freedom to add as many Twitter accounts to meet your personal and professional needs, and that's just the start. Owly offers the most options for UI customization, letting you tweak its headers, navigation bar location, and even change the font style for a totally unique look. The app also gives you multiple dark themes to choose from, including blue, black, and even purple. Timeline filters are another strong suit of Owly. These let you declutter your feed to only display tweets that you actually read and give you further options to filter out distractions such as retweets, replies, and video autoplay through a series of toggles found within its settings page. As far as ads go, Owly displays them as promoted content that blends into your Twitter feed for less distractions. (1) Media attachments are prominently displayed by default. (2) You can hide pictures, GIFs, & videos, however, for easier browsing. If you're big into downloading media, Owly has you covered as well. The app lets you download all types of media directly onto your device, including GIFs, videos, and images. In addition, Owly also supports widgets and app shortcuts, so you can view and post tweets, search for a user, or even send a message from the comfort of your device's home screen. Limitations with the app are few and far between. These include a search function that's buried behind the three-dot overflow menu and the lack of swipe-based controls for navigation between different tabs like direct messages and timeline. Fortunately, Owly has offset this by giving you the option to place the navigation bar on the bottom of the screen for easier reach, which comes in handy if you have a device with a large screen like the Note 9. TweetCaster is another great Twitter client that comes with a healthy dose of features that other apps would normally charge for. For instance, the app lets you add as many Twitter accounts as you want without having to pay for a pro version, which is incredibly handy if you have two or more accounts for both private and work-related use. Another standout feature found in TweetCaster is its Smart Filter system, which you can access through the overflow menu button on the top-right. This lets you filter out the noise and display only keyword-specified tweets, posts that contain media, a gallery view, or tweets with links, and it even lets you hide retweeted content. If those weren't enough, the app sends you separate notifications for each account along with a short preview, so there's no need to manually switch accounts to view new content. Similar to Owly, TweetCaster has a wide variety of light and dark themes that you can apply for a more custom feed. Unfortunately, the app's UI isn't as flexible, and while you can change the app's font size to aid in reading, TweetCaster doesn't give you the option to set its navigation bars to a location of your choosing. This is far from a deal breaker, however, as TweetCaster comes with gesture-based navigation to let you instantly view other tabs simply by swiping sideways. To further separate itself from the rest of the pack, TweetCaster gives you the ability to schedule posts at a later time, along with the option to save them as drafts so you can fire off the tweet when you're satisfied with it, without having to start over. In addition to that, TweetCaster also supports in-app viewing of media from both YouTube and Instagram for unimpeded Twitter feed browsing. As awesome as TweetCaster is, it has some shortcomings which ultimately kept it from grabbing the top spot. Most notably, TweetCaster is fairly limited when it comes to directly downloading media content, only letting you save images. And while the app gives you the option to upload videos and GIFs, it redirects you to a YouTube login page that results in an error. Static banner ads are ever present in TweetCaster, and are permanently set along the bottom of the screen. While relatively unobtrusive, these banner ads are still an eyesore, especially when compared to promoted content found within apps like Owly that seamlessly blend in with your timeline. If you want to get rid of these ads for good, be prepared to shell out $4.99 for an ad-free experience. Friendly for Twitter has a vibrant, eye-pleasing layout that's easy to access and interact with thanks to an intuitive UI and simplified settings that ensure you spend less time finagling around with the app and more time enjoying the content on your Twitter feed. Friendly's simple design is intentional — it's been developed specifically to run as efficiently as possible to maximize battery life. This translates to minimal background tasks and services, along with optimized animations to keep battery drain to a minimum. If you want to take power consumption a step further, Friendly even gives you the option to disable all notifications, direct messages, and set the frequency it checks for new tweets at longer intervals to keep your device alive in a pinch. Despite its focus on energy efficiency, Friendly nonetheless comes with a slew of useful features to maximize your Twitter experience. Chief among these features it the ability to download images, videos, and GIFs directly onto your device, and send and receive direct messages containing images and GIFs. Besides those, the app also comes with a dark theme that you can enable for easier nighttime viewing in addition to further preserving battery life. Naturally, Friendly's focus on battery conservation and efficient operation across a multitude of Android devices means means sacrificing some features to achieve those ends. The app lacks some functionality compared to other apps on the list, namely the ability to save drafts for a later date, schedule posts, and support for widgets and app shortcuts. Despite its limitations, Friendly is still a fairly balanced Twitter app that's definitely worth a try. Its user-friendly UI very easy to get accustomed to, and is especially suited for older and mid-tier devices thanks to its battery-efficient design. Though not as aesthetically pleasing as Owly or Friendly, TwitPane still manages to set itself apart from the rest of the crowd due to its overall flexibility and customization options. Besides the standard dark theme, the app also lets you change the font size, remove annoying source app texts on the bottom of tweets, and much more. Where TwitPane really shines, however, is in its tab customization. The app contains 15 separate tabs that can be accessed via sideways swipe gesture, including tabs for Timeline, Likes, Profile, and Search, just to name a few. To minimize confusion, the app gives you the ability to reorder, remove, or add new tabs to better suit your needs. Additionally, TwitPane comes with a slew of other features that make it competitive with other Twitter apps, such as direct messaging support, the option to download media files directly onto your device, tweet GIFs, save drafts to post later, and more. Thanks to widget and app shortcut support, you can even view and post tweets without having to access the app for added convenience. On the flip side of the coin, TwitPane only lets you sign into three separate accounts, which may be less than ideal if you rely on more than that for social media needs related to your work or hobby. And like TweetCaster, the app features static banner ads that are prominently displayed along the top of the screen. Lastly, TwitPane is also limited as far as third-party support goes — it doesn't let you watch YouTube videos within the app or view content that's hosted on Instagram. In all, TwitPane is still a great choice if you're in the market for a Twitter app that gives you control over what tabs you want to have access to and don't mind the relatively minor issues mentioned above. 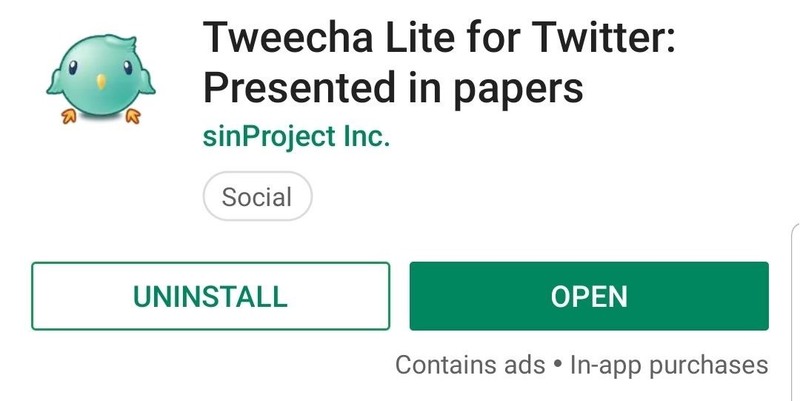 Last, but certainly not least, is Tweecha Lite, a simple Twitter app that comes with a number of great features and options to maximize your social media experience without getting lost in UI customization. The app is free to try out, with the option of buying its full version for $5.49 to get rid of banner ads and unlock more features. Tweecha Lite has an astounding 18 separate tabs that cover all the bases with regards to tweeting. Besides the all-important timeline, you also get separate pages for mentions, tweets you made and replies you may have gotten, a search page with its own options for advanced searches, retweets, likes — the list goes on. Obviously, the sheer amount of tabs can make navigating through Tweecha Lite cumbersome, so to aid in getting around, the app employs a simplified navigation bar on the bottom for vital functions like instant tweeting and quick access to all the tabs via a menu button. Additionally, the app gives you the ability to cycle through its pages by swiping left or right. If you're in the habit of carefully crafting tweets before posting them to the world, Tweecha Lite lets you save unsent tweets as drafts that you can revisit and post at a later date. Besides that, the app also comes with a dark theme which can be accessed within "Color settings" section inside the app's settings page. Options to customize the app's UI are fairly limited, however, and basically consist of tweaking background colors of specific tweets for easier sorting. Like TwitPane, Tweecha Lite lets you connect to only three separate accounts off the bat, which is further expanded to a maximum of five after purchasing the full version. Because of this, Tweecha Lite may not be suited for those who have more than three Twitter accounts for work, business, and personal use. Tweecha Lite starts to fall short when it comes to watching YouTube videos, as tapping on them transfers you out of the app itself and into YouTube. This can be a hindrance if you frequently watch YouTube hosted content and quickly move down on your feed to sort through tweets. Unlike TwitPane, however, Tweecha Lite does let you view media files originating from Instagram. Unfortunately, that's just the start of the app's issues. Like TweetCaster, Tweecha Lite only allows for image downloads, with the ability to save GIFs and videos onto your phone out of the question. To make matters worse, sending direct messages isn't supported, making it a non-option for many who rely on the feature. In the end, Owly won out due to its careful balance between ease of use and customization options. It was far from a blowout, however, as the other apps on this list each had standout features that make them solid choices, such as TweetCaster's smart filter, Friendly's battery optimization, and Tweecha Lite's intuitive navigation controls. What's your go-to Twitter client app and what do you love about it? We look forward to hearing your thoughts, so don't hesitate to share them by posting in the comment section below.